Kentucky Guardsmen, Mayor of Frankfort and Canadian dignitaries gather at the Kentucky State War Memorial at Frankfort Cemetery in Frankfort, Ky., for a wreath-laying ceremony honoring fallen Soldiers of the War of 1812. FRANKFORT, Ky.—The Kentucky National Guard’s eight-month journey commemorating the 200th anniversary of Kentucky’s involvement in the War of 1812 and strong partnership with Canada came to an end during Canada week in Kentucky Feb. 10-14. 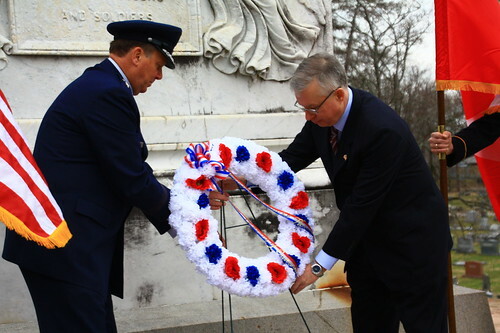 The week began with a wreath-laying ceremony at the Kentucky State War Memorial where fallen Kentucky Soldiers were honored at the Frankfort Cemetery, Feb. 9. Guest speakers included the Adjutant General of Kentucky Maj. Gen. Edward W. Tonini, Consulate General of Canada Dr. Roy Norton and Mayor of Frankfort William May. “History is something Kentuckians and Canadians share a passion for,” Dr. Norton said. “Canada has been very serious in commemorating the bicentennial of the War of 1812 and I know Kentucky has been too,” he said. Command Historian John Trowbridge said the Commonwealth of Kentucky made an extraordinarily disproportionate contribution to the American war effort during the War of 1812. “Over 60 percent of the entire war’s American casualties were Kentuckians,” Trowbridge said. “The sacrifices of those Soldiers paved the way for 200 years of peace and friendship between our two nations,” he said. 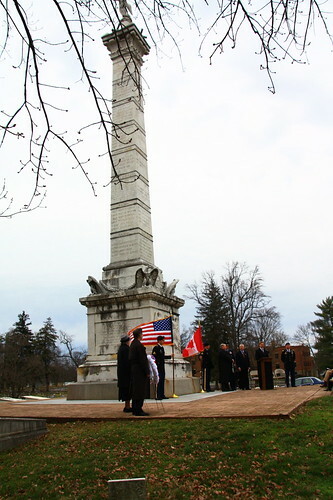 Adjutant General of Kentucky Maj. Gen. Edward W. Tonini and Consulate General of Canada Dr. Roy Norton lay a wreath at the Kentucky State War Memorial in honor of fallen Kentucky Soldiers of the War of 1812 as part of commemorating the bicentennial of the war and Canada week in Kentucky, Feb. 9. Today, the two countries have a great relationship but Canada is also Kentucky’s biggest trading partner. In 2012, the Commonwealth of Kentucky made approximately $7.3 billion in sales to Canada, a record number. Kentucky’s exports in the last decade to Canada have gone up more than 100 percent. 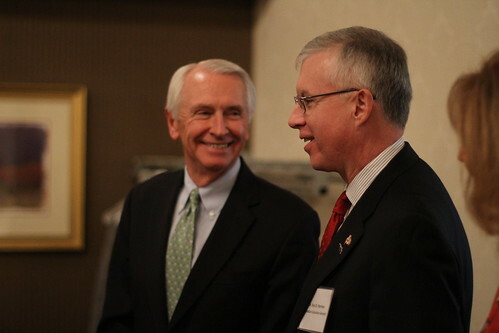 Governor of Kentucky Steve L. Beshear talks with Consulate General of Canada Dr. Roy Norton during a reception honoring Canada Week in Kentucky at Capital Plaza in Frankfort, Ky., Feb 12. Dr. Norton said there were a lot of people that made Canada week a success in Kentucky. “The consulate doesn’t spend a week anywhere very often but the folks in Kentucky are important to us,” Norton said. In a previous visit, Norton said he had the privilege of attending the Kentucky Derby where he bet his money on a Canadian-owned horse. However, his true taste of Kentucky came when he attended a University of Kentucky Wildcats game in Lexington. From the Consulate General of Canada’s office Dennis Moore, public affairs officer, and Dr. Roy Norton receive Kentucky National Guard’s ‘Honorary Guardsmen’ certificates from Adjutant General of Kentucky Maj. Gen. Edward W. Tonini at a reception honoring Canada Week in Kentucky Feb. 12. In appreciation of a successful Canada week, bicentennial of the War of 1812 and continued partnership of the two nations, Tonini presented Dr. Norton and his public affairs officer Dennis Moore with the symbolic title of ‘Honorary Guardsmen’. 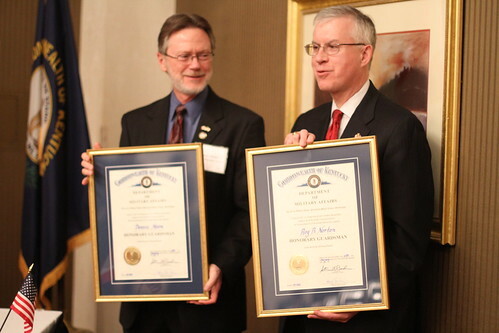 “I thought of the significance of Kentuckians who fought around the country during the War of 1812,” Tonini said. “And we decided to make our partners in Canada honorary Guardsmen which is the ultimate honor here in Kentucky,” he said. For more photos of the events please click HERE eh?